Drills, Circular Saw Blades, Metal Band Saw Blades, Cooling Liquid, Punches and Dies. Mobile Luminaires and special cleaning agent for industry. Procurement and marketing of high-quality used machinery for steel construction, steel trading and metal construction. That's our core business. No more and no less. Here we know our way around the best - in Germany and worldwide in the market. Who works hard deserves best support. 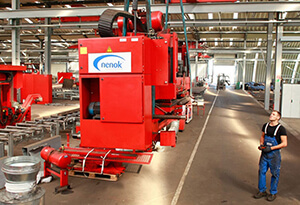 Tools by nenok – premium quality at a fair price. Tools for saw drill lines, band-saws, circular saws, beam drill lines, burning machines, punchings and shears. Repair and maintenance of plant and machinery require service professionals. Hands-on professionals, who understand their business and make things happen. So that your machines are always well lit and look great. We support you.